Brussels sprouts, what a misunderstood vegetable that’s finally getting the recognition it deserves. I really didn’t give them much attention until they started showing up in our CSA, complete with their stalks. For freshness, it’s hard to beat any vegetable that comes to you nearly in its in-the-ground state. Roast the sprouts and integrate all ingredients. Prep the greens by pulling the leafs from the rib section, rinse thoroughly and tear into pieces. Hand wash each of the sprouts, getting all dirt out from the base and between the leaves. Remove any loose leaves. Cook the bacon over medium-high until nice and crispy and set aside on a few towels. Pour out all but about 1 tablespoon of the bacon fat. With the pan still warm, add the white wine and use a soft spatula to deglaze the pan and pull up the tasty bits stuck to the surface. After you have everything pulled up, pour in the stock and add the cold butter. Reduce this down by half to thicken and integrate the flavors and then pour back into your measuring cup. Place the greens in the pan, still at medium high, and sautee until they soften. You don’t want them completely shriveled up, just 3-4 minutes to soften the texture. Add a little bit of the broth as necessary. Remove to a separate bowl when cooked. 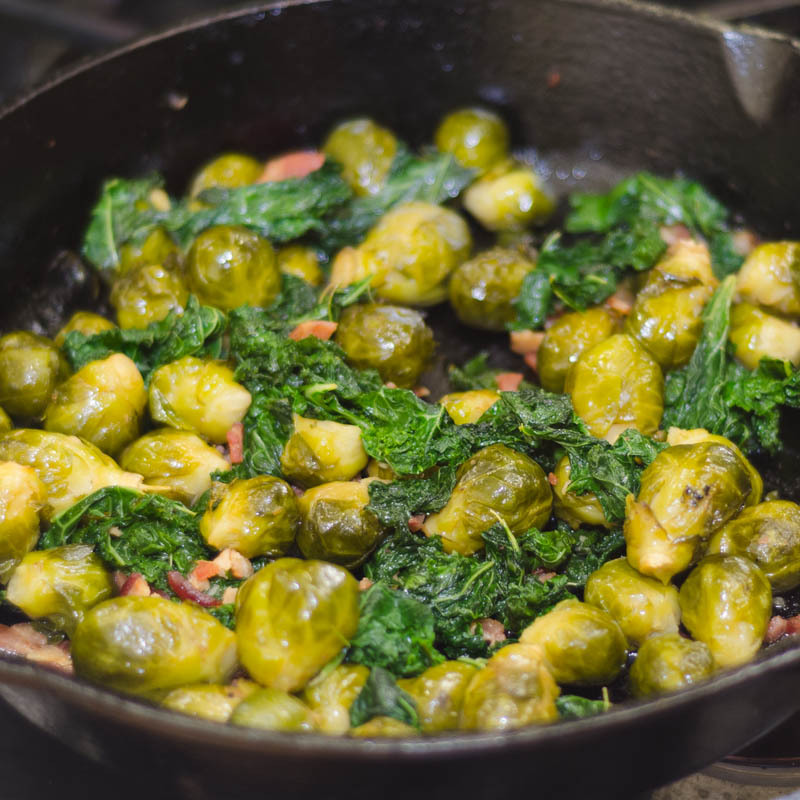 Toss the Brussels Sprouts with some of the broth and place them in the pan. Pour in enough of the broth to cover the bottom of the pan. Total roasting time is 30-40 minutes depending on the size. About halfway through, stir them around in the and add more broth (as needed). Just before removing them from the oven, crumble and add the bacon as well as the greens. Finish with a little more broth for moisture and you’re all set. I just tried brussel sprouts a few days ago for the first time and I loved them. Yes, I am one who had this vegetable misunderstood. I usually just toss mine in chopped pancetta bacon, pepper, kosher salt and minced garlic and roast them in the oven…I can't wait to try your take on them. Sounds good. Thanks for sharing. Like what I am finding here.